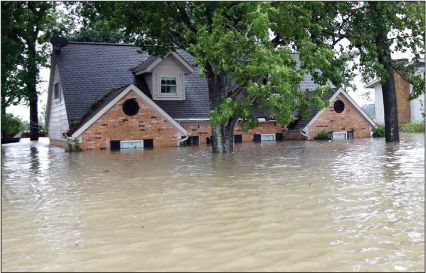 Severe flooding is becoming increasingly common in the U.S.—and more destructive. Which areas are most vulnerable? Nearly 10 million U.S. households sit in 100-year floodplains, mostly on the Gulf and Atlantic coasts. Among the most vulnerable cities are Boston, New York, Tampa, Miami Beach, and New Orleans. But location isn’t the only factor—another is overdevelopment. When cities spread out across large areas, developers often pave over the grasslands and wetlands that would otherwise absorb excess water. Houston, which has no citywide zoning laws, is a good example. Dubbed “the Wild West of development,” the oil-andgas hub laid concrete over 30 percent of its surrounding wetlands between 1992 and 2010—some 25,000 acres. To make matters worse, much of the city’s expansion has been in flood-prone areas: At least 7,000 residential buildings have gone up since 2010 in the city’s 100-year floodplains. Why build in flood zones?